It's done. House of Cards is over and…the house the Underwoods built still stands. The Emmy-winning Netflix drama that helped launch the streaming platform's originals slate dropped its sixth and final season on Friday, Nov. 2, after nearly collapsing in on itself after cutting ties with Kevin Spacey following sexual misconduct allegations. Writers had to scrap the final season and start fresh, writing out Spacey's Frank Underwood and refocusing on Robin Wright's Claire Underwood. Yet Frank Underwood was still very much part of the series, a constant problem for all involved. 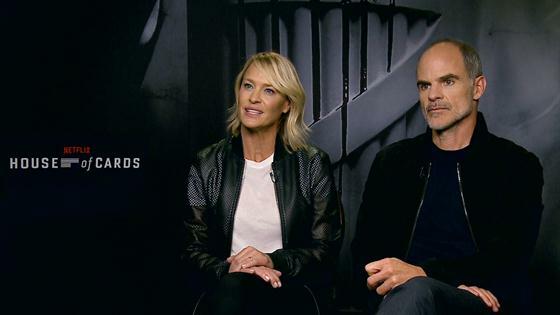 Over the (confusing) eight episodes, the writers pitted Claire Underwood against Michael Kelly's Doug Stamper, two of the characters closest to Frank, and only revealed what really happened to Frank in the final moments of the series. Spoilers follow. Doug killed Frank, but only because Frank was about to kill Claire. Doug said he did it to protect Frank's legacy, basically his one goal in life. Doug was also intent on killing Claire…until she got the better of him. Yep, Claire, who was miraculously pregnant with "Frank's" child, murdered Doug right in the Oval Office. And that's how the series ended. Executive producers Melissa James Gibson and Frank Pugliese said the two characters, who hardly interacted over the course of the previous five seasons, needed to have a showdown. "We knew that we wanted the end to feel surprising but inevitable. It needed to be both those things. We really did explore every possibility, but just in terms of Claire's psychology—and actually Doug Stamper's as well—until that was what became clear as the right thing to do," James Gibson told The Hollywood Reporter. "It started with the seeds of the relationships throughout the series, but also from that dinner the three of them shared at the end of season five where [Claire and Frank] ask Doug to take the fall for them." "We knew we wanted the ending to be cathartic and for it to be some sort of release; the complicated reveal of many aspects of Claire's character. Exactly how that was going to happen and if somebody was going to die, or pay the price, for all that, we didn't know until we got close to the ending. Also, during the course of working on the season, you start to realize that the two characters who had the most invested in each other, either by potentially being allies or actually by being the existential threat to the other, were Doug and Claire now that Francis was off the screen. It seemed like the showdown was the inevitable showdown," Pugliese said. The intention for the final season, according to the executive producers, was to be a final battle between Frank and Claire. With Frank gone, they shifted antagonists and had Doug Stamper, among others, stand in place of Frank. "We knew the stakes would be life and death for both of them and that it would be a bloody civil war. How literal that got was part of the discovery. But this partnership [between Claire and Frank] was no longer tenable and I think that got exposed and became clear by the end of season five. This was to be the season of the showdown, and I think it still is. It's just without him on screen and with other characters filling the void," James Gibson said. Before Doug met his maker at the hands of Claire, he was playing both sides of the battle between Claire and the Shepherd siblings (played by Diane Lane and Greg Kinnear). He even brought Claire a list of everyone working against her. "He can't stand the Shepherds or anything they stand for. They're terrible people to him. What he's wanted more than anything—what he always wanted—was to protect Frank's legacy. All he wants is for Claire to pardon Frank posthumously. He wants that name to be cleared. He presents this [list] to her, and all he wants is for her to say that she'll do it. And when he realizes he's not gonna get that, he can't bring himself to kill her because there's a part of Frank alive in her, still. And that's the final thing for him," Kelly told Vulture. By introducing new characters played by Lane and Kinnear so late in the game, and elevating Kelly's Doug Stamper to main antagonist, House of Cards ended in a frustrating jumble. Yes, Claire's secrets were protected still, but the body count was astronomical, and the ending didn't feel earned. Claire and Doug had ties to one another via Frank. Rather than letting Wright's character stand on her own, the season remained too tied to Spacey's character. There was really no way around that, given he was the central figure of the series before Netflix cut ties with him. House of Cards wrote itself into a corner and did its best to get out of it. All six seasons of House of Cards are now streaming on Netflix.